When I first thought about implementing payment via a crypto currency I looked at the available solutions like Stripe. The problem I had with stripe was that they allow Bitcoin payments only with US merchant accounts so this was no option for me. In the Ethereum world it looks even worse. There are a few newer services but of course they all want their share of the cake. We'll use the vanity-eth from nodejs for generating the addresses. You also need some Etherum nodes. I'm using Parity since it's fast and reliable. Start it with these parameters, but don't expose the nodes directly to the internet, keep them behind firewalls without port forwarding. For even faster deployment you can use the Parity Docker container. You can also save the data so you won't have to re-sync every time you remake the container. First create a folder named "libs" and clone the php-ethereum repo into it. The ethereum-php project is a nice wrapper for the json-rpc class. There are multiple ways to do this depending on your service. 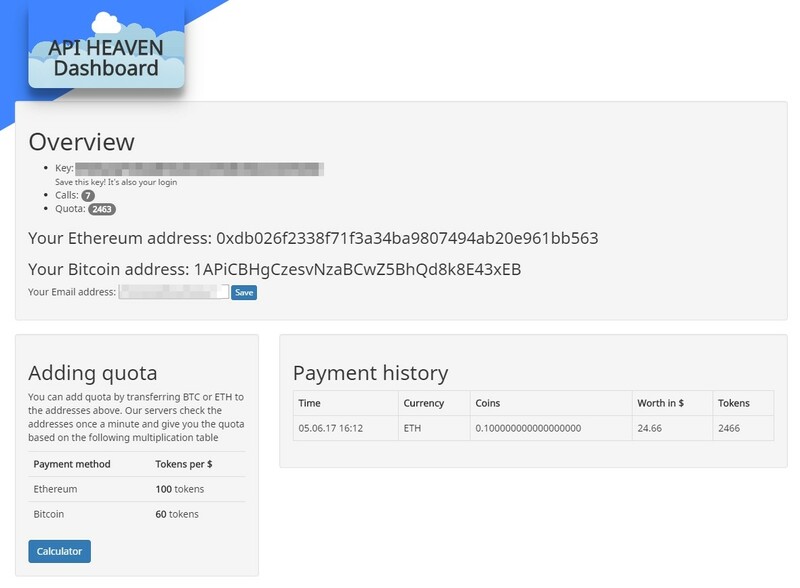 On API Heaven we give each customer a ETH address which they can deposit funds to. A cronjob checks all customer addresses every minute to detect changes. If they added ETH to the address, the balance is converted to API quota so our customers don't even need to log on to the site to add funds. Another aproach would be to calculate a fixed price and save it in the user session. The customer has to pay while they're on the website and you check with AJAX for received payments. If the whole amount is received, the backend triggers the sale.